Rice paper spring rolls have always been one of my favorite things to order at Thai and Vietnamese restaurants. What could be better than a spring roll that’s not fried, but has an oddly satisfying squishy bite, and is stuffed with all kinds of delicious veggies? For the longest time I never made them at home. It seemed so intimidating! Until I heard about a restaurant that served a DIY spring roll platter where patrons stuffed and wrapped their own rolls, which okay, I found appalling at first. This wasn’t an activity for anyone. Spring roll wrapping requires skill. Those wraps are delicate! Then it clicked: who cares? Rice paper spring rolls are delicious, even if they fall apart or don’t look so hot. So I started making them at home, and guess what? It was way easier than I’d imagined! Okay, it takes a little practice and maybe a few rolls out of every batch don’t turn out great looking, but remember what I said: still tasty! It also helps to keep a few tips in mind, so if spring roll wrapping is new to you, listen up. First, start small. Less fillings are easier to roll, so keep them to a minimum in the beginning. Also, keep a few extra wraps on hand, because if your rolls are small you’ll probably end up with more, and because if you really screw one up you can always start over with the same fillings and a brand new wrap. You’ll be submerging each wrap in warm water to soften it up before rolling, and it will be very pliable and very wet. A good, clean work surface helps a ton. I have wooden countertops, so I work over a sheet of parchment. If you’ve got something less porous you should be fine to work right on the counter, but towel if off after every couple of rolls. I also always find that my water bath cools off quite a bit while I’m working, so I keep a cup of very hot water handy to warm it up. The awesome thing about making your own spring rolls is that you can fill them with anything, and I do. Since the weather is just warming up I got inspired to throw some tropical flavors into spring rolls, so I went with mango as the star of this batch. I also included with lots of fresh herbs for a blend of sweet and savory flavors. The almond sauce is a little something different, but I love the combination of almond butter and mango. 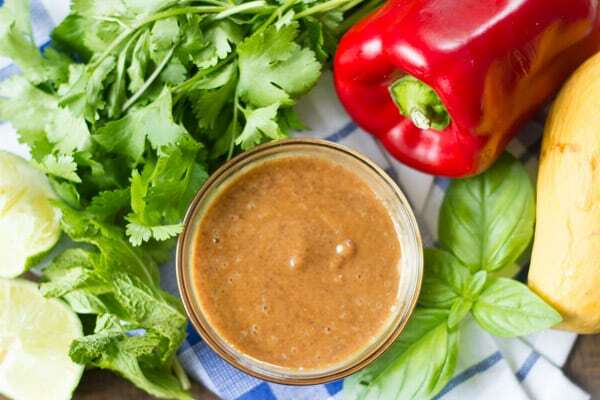 If you dig peanut sauce I think you’ll be a fan. 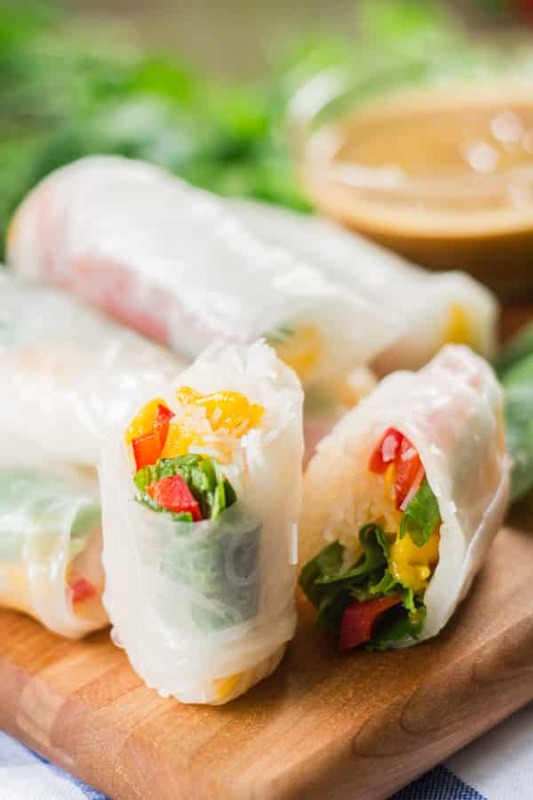 These tropical-inspired spring rolls are stuffed with rice noodles, juicy mango slivers and crunchy red bell peppers, and served up with a rich almond butter dipping sauce. Bring a medium pot of water to a boil. Remove from heat, add the rice noodles and soak according to package directions, until tender. Drain the noodles into a colander and rinse them with cold water. Return the noodles to the pot and toss with lime juice. Assemble your ingredients around a clean work surface and fill a large, shallow dish or bowl with warm water. Place one rice paper wrap into the water and submerge. Allow it to soak until pliable, about 30 seconds. Carefully remove the wrap from the water and lay it flat on your work surface. Arrange about 2 tablespoons of the noodles in a two-inch strip at the center of the wrap. Arrange a few strips of mango, red pepper and green onion over the noodles and top with a few cilantro, basil and/or mint leaves. Carefully fold the side of the wrap closest to you over the fillings. Tuck the sides in, over the fold, then roll the filled portion of the wrap away from you to close up the wrap. Repeat until all wraps and fillings are used. Whisk all ingredients together in a small bowl, thinning with hot water as needed. These sound absolutely amazing. I’ve made spring rolls before and the learning curve wasn’t too bad. If you like peanut butter sauce I think you’ll love this. 🙂 Thanks so much Sonja! I’ve never made spring rolls before but these looked quite interesting and I decided to try them. Had to watch a youtube video though to see other recipes but it was quite the adventure to make these. The mangoes gave the rolls a great flavour and it’s something new that i’ll incorporate in future dishes. I’m glad you gave it a try and enjoyed the rolls! It really is an adventure, like you say, at first, but lots of fun once you get the hang of it. 🙂 Thanks David! Really delicious recipe and easy to make too. I was wondering if next time I could substitute the almond butter for peanut butter, I have a slight intolerance to almonds even though I still eat them because they’re delicious.